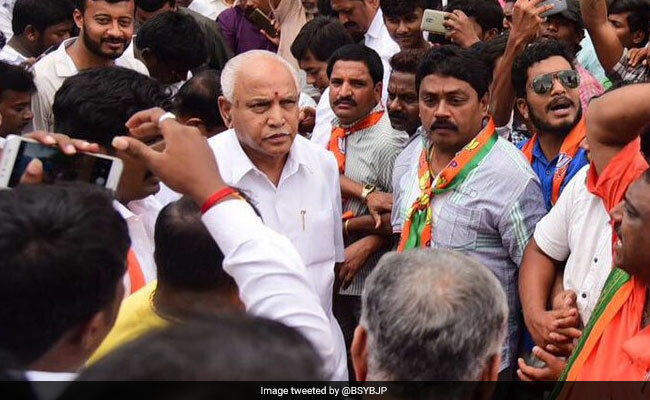 Bengaluru: BS Yeddyurappa, the BJP's chief ministerial candidate in Karnataka and its most prominent Lingayat leader in the state, doesn't seem quite sure how to react to the Congress government's recommendation that Lingayats be considered a minority religion. "From the beginning we have taken the decision that let the Akhil Bharatiya Veerashaiva Mahasabha, let them take a final decision about this. Siddaramaiah has taken some decision. Let the Mahasabha take a decision in the interest of the community," he said after meeting BJP and RSS leaders on the issue. In poll-bound Karnataka, the BJP's lawmaker from Bengaluru South and union minister Ananth Kumar was much more forceful. "Karnataka Chief Minister @siddaramaiah has emerged as modern day Robert Clive. He is emulating the colonial master & trying to play politics of divide & rule," tweeted Mr Kumar. The Congress is trying to convince voters that the timing of the move had nothing to do with elections. "The demand to recognize the Lingayat faith as a religion is an old one. What the Government has done is a recognition of a fact acknowledged as far back as the Mysore Census of 1871. Those in BJP accusing us of dividing religion better listen to the Lingayat-Veershiva community," Chief Minister Siddaramaiah tweeted. Congress president Rahul Gandhi is on his latest tour of Karnataka -- this time in the coastal Dakshina Kannada district, Chikmagalur and Hassan. On Tuesday, he continued his temple run visiting the Gokarnatheshwara temple in Mangaluru. This time, he balanced it out with visits to the Rozario Church and the Ullal Dargah. But on Wednesday, it was back to temples, with visits to the Sharadamba Temple in Sringeri and a meeting with Jagadguru Shankaracharya of the Sringeri Mutt. He also met students of the Veda Pathashala there. On an earlier visit to north Karnataka, Mr Gandhi had made it a point to visit Lingayat mutts -- underlining the importance given to this community by political parties. Lingayats who account for about 17 per cent of the voters, have a big presence in the field of education. The reaction from within the Lingayat community to the state government's recommendation for a separate religion is mixed. "I want to say this is a hasty decision. Despite representatives from the five main Veerashaiva mutts giving a representation against this move to the Chief Minister, he listened to a few independent Lingayat mutt heads. We condemn this recommendation to the Centre," said the seer of the Rambhapuri Mutt. But right now, while political parties try to calculate the possible outcome of the move, the impact on the Lingayats themselves is still notional. The final decision lies with the centre.